Ella in the Teacups from David Morley on Vimeo. Disney World was AWESOME! Everything about our trip was spectacular, except the length. Hopefully we can stay longer next time! Ella was fantastic on the flights! *Thank the lords of the electronics who created portable DVD players* She was pleasant & happy to watch movies or read. The only tiny problem we encountered was on our last flight, from Atlanta to St. Louis. Ella fell asleep before we took off & as soon as we were at cruising altitude, I picked her up & just held her so she’d have a more comfortable place to rest. She slept until we were descending for landing & at that point, her ears started bothering her. She cried for a few minutes, but then she was fine. I hope we didn’t bother anyone too tremendously, but at the same time, I don’t care that much. She did much better than I could have expected a 2 year old to do! We ended up renting a car for our stay because it was easier than taking a cab from the airport. Well, kudos to Enterprise for being awesome! They saw that we had some big bags plus a stroller, so they asked if we’d like an SUV instead of a full size car. FOR FREE! Yes please! So we had a Nissan Pathfinder, with Ella’s car seat, & still plenty of room! It actually worked out better for us to have a car because the shuttle from our hotel (WorldQuest Resort) to Disney World did not have any pickups during the day. Our hotel was fabulous! It is really close to the Nickelodeon resort/hotel if you’ve ever been around there. It was relatively easy to find (thanks in part to GPS!) & close to a grocery store, a few restaurants & DISNEY WORLD! Though the resort was big, there was almost no one there! We saw people at the continental breakfasts in the morning and occasionally in cars, but for the most part, it felt like we had the place to ourselves! Our condo was 3 bedrooms, 3 bathrooms with a full kitchen, nice living space w/ dining area & a screened in porch w/ a view of a pond & the pool & nothing else! We weren’t looking at highways or other resorts or anything…very peaceful! The pool was HUGE & pretty much empty…SCORE! The weather was perfect! It was low humidity, but still warm (low 80s), not too hot. We went to Disney World (Magic Kingdom) on Wednesday. Because we drove, we did have to pay for parking, but it wasn’t any more expensive than paying for parking at the Zoo, Grant’s Farm or a nice long walk to Busch Stadium ($12). After parking, we took a tram to the ticket center where we bought my ticket, picked up Dave’s free ticket, got a Happy Birthday button for Dave & a First Visit button for Ella. The ticket lady was super nice; she asked what we were looking forward to most, then gave us advice on how to get to do that the easiest, along with maps & schedules of parades, character encounters & shows. From there, we took the monorail (you can also take a ferry or a bus…we ended up using all of them) to the Magic Kingdom! HOORAY! 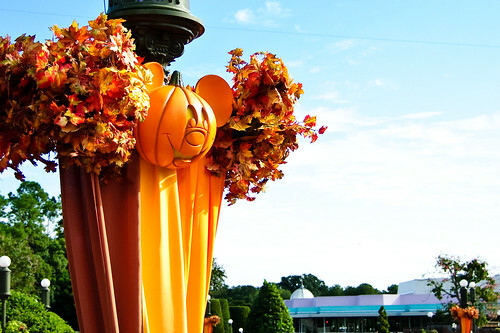 Everything was decorated in fall & Halloween stuff…so cute! From my perspective, it did not seem to be all that crowded. Yes, there were lots of people there, but we did not wait in line to get on the monorail (we essentially got a car to ourselves), the line for bag searching was maybe 1 minute, and the longest ride line was Dumbo at maybe 10 minutes. We used a fastpass to ride Peter Pan (probably not worth it for a 30 minute wait) but other than that, the lines were very short! On many of the rides & shows, we just walked right up & got on! Ella was really overwhelmed at first, but quickly grew to love it. She rode Dumbo, Cinderella’s carousel, the Teacups, Peter Pan, Small World, Buzz Lightyear’s Ranger Spin something ride, Pirates of the Caribbean & Aladdin’s Magic Carpets. We also saw Mickey’s Philharmagic & the Monster’s Inc comedy show. The Philharmagic was in 3D & Ella was NOT EXPECTING THIS. As soon as the first 3D object (a flute!) flew toward our faces (watch everyone flinch! ), Ella FREAKED OUT! Poor baby. She crawled up Dave & squeezed onto him! We promptly removed her 3D glasses & she was a bit more comfortable, but still not a huge fan of the squirting water, etc. I, on the other hand, thought this was one of the best things we got to do! 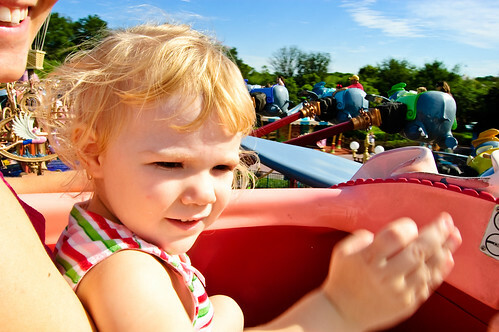 Ella loved pretty much all of the rides, but I think the Teacups were her favorite. We have a video of her riding them, which I will post as soon as I can get it zipped up & ready for viewing. It’s pretty cute! We did several things in the morning, then drove back to have lunch & take a nap. This was a great plan because it gave us all some down time with quiet, no crowds & out of the sun for a bit. Ella was excited to go back in the evening (though she HAD to take her Mickey balloon back to the park with her) where we ventured into Tomorrowland & Frontierland/Adventureland. The lines in the evening were shorter than in the morning! We had dinner at a sandwich/burger-ish place. I had pulled pork, which was fine, but apparently the burgers weren’t as good. If there is one downside to Disney World, it was probably that we paid more for food than it was worth. We watched the parade full of lights & characters. Ella got to see Mickey, Goofy, princesses & fairies, so she was happy! We also watched the fireworks, which were great! It was Ella’s first time seeing fireworks since she’s always been in bed on Fourth of July! Though they were a bit loud for her at first, she grew to enjoy them. It was an exhausting but wonderful day. I can’t say enough how nice & helpful everyone at Disney was! Everyone, even the janitors, would stop to help you find something, always with a huge smile. Dave was wished Happy Birthday countless times. Ella was called “princess” all day long. Pretty perfect. We spend Thursday swimming in the enormous & open pool and at Downtown Disney. Ella got a Mickey shirt (pink ringer w/ a retro Mickey…so cool), played with legos at the Lego store & fell asleep at dinner at the dinosaur restaurant. The dinosaur restaurant was cool & informative, but VERY LOUD. We could barely hear each other across the table & Ella got scared of the moving dinos (they’re “real size”). 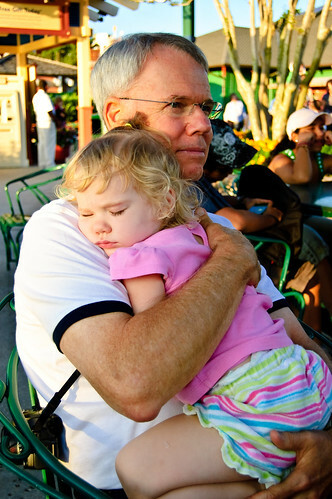 Other than that, we probably wouldn’t dedicate a whole day (or afternoon) to Downtown Disney again. It was mostly stores & restaurants with a huge arcade-type thing (admission fee!) that wasn’t really suited for Ella’s age. More pics can be seen on Dave’s flickr, Teacups video to come soon!